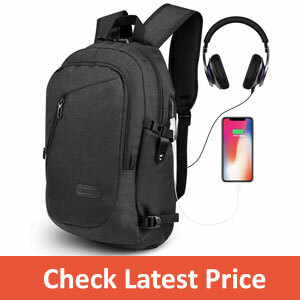 In this article, you will learn about 15 best anti theft backpacks for travelling of 2019 and things that you must consider before buying an anti-theft backpack. Anti-theft backpacks are necessary when you are roaming on unknown streets. They assures safety of your belongings from pick-pocketing and even bag snatching. Cut-proof materials with hidden and lockable zippers make them safer. It’s hard to open such bags and get things out from them. Many anti-theft backpacks also come with RFID blocking material in some pockets which provide protection against RFID-related crimes. Anti-thefts are definitely useful for protection against theft but you must remember that not all anti-theft backpacks are created equal. 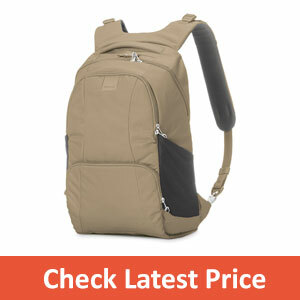 If you are looking for a perfect anti-theft backpack Pacsafe Metrosafe LS450, Khaki could be your first choice. The backpack comes with an anti-theft technology and is spacious. You can carry as many necessary stuff as you prefer depending on the duration of the trip. 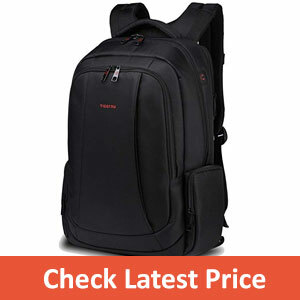 The backpack comes with a well-padded shoulder strap which comforts your shoulders. Also, it distributes the weight evenly on your back and shoulders despite the weight. There are many compartments with enough space to keep your things organized. Along with that, you can fit in the laptop of screen sizes 16+ inches into the laptop sleeve of this bag. Made of durable 20D nylon FD hitra, it is waterproof and cut proof and keeps your belongings safe from thieves and weather. Want advanced security of your belongings? 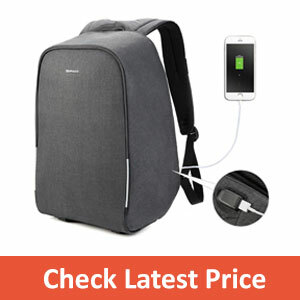 Pacsafe anti-theft backpack is perfect for you. This backpack has different advanced security features to make your journey secure. The external part made of 20 Nylon Full Dull Mild Oxford & PU1000m and inner polyester lining upgrades its quality. Water resistant, it is a perfect partner on a trip. The backpack has two main compartments to fit in your belongings. The volume of the backpack is 25 Liters which can fit your needs for any weekend or week-long trips. It is vertical length along with laptop padding keeps your laptop safe wherever you go. It is a lightweight and slim bag having a sportier look and is available in a range of styles to choose from. Plus, the choice of colors is an extra perk to buy this backpack. Pacsafe Metrosafe LS350 is a roomy and sturdy backpack. It incorporates different anti-theft technologies along with various organizational options. The feature-rich backpack is perfect for abroad adventure as well as everyday traveling. The bag comes with well-padded compartments. It features a laptop compartment to keep your laptop inside it. It is a light-weight back with many compartments. It can pack almost everything you will need for a day out. The number of pockets and size of this backpack is perfect. The presence of side pockets with water pouch makes it handy to carry a water bottle. In general, the backpack has thorough designs to cover up the requirements of a day out. Smart zipper and Lock about security clip features. Not recommended to carry laptop having screen size above 14 inches. 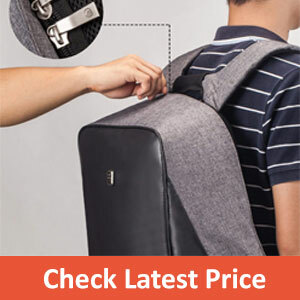 Bobby, the original anti-theft backpack by XD design is a perfect anti-theft backpack. It has features like integrated USB charging port, Water repellent as well as cut-proof material. And reflective stripes for optimal weight balance. The backpack comprises adjustable open angles and luggage straps which makes commuting easier. The backpack made of 600D Polyester has anti-shock foam. This multilayered bag has a Cut proof pp protection board. The shockproof design avoids the pressure on your spine and shoulder. The water repellent material keeps it dry even in rain. While the reflective stripe on the backpack will always make you visible in dark. 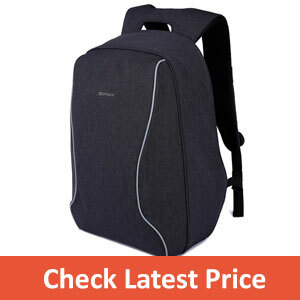 Pacsafe Venturesafe 15L GII is a light and durable backpack featuring anti-theft technologies. This bag is ideal for daily travels, adventures, and trekking. The backpack can hold a laptop, camera, a small jacket, a water bottle and few other simple accessories. The presence of zipper clips ensures safety whenever you travel by bus or train. 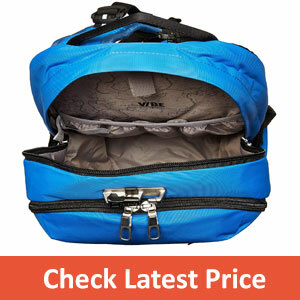 Venture 15L is a medium sized lightweight anti-theft backpack. 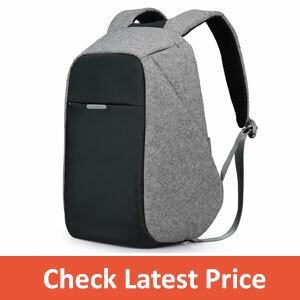 The backpack has padded adjustable shoulder straps and sternum strap. It can fit in everything you need for a day traveling. The side and front pockets hold the basic items of travel. Slim design with a front cross-buckle. Has a water bottle pouch. Has front pocket for smaller items. Mesh protection only limited to the base. If you are planning a weekend journey or drive and need a backpack. 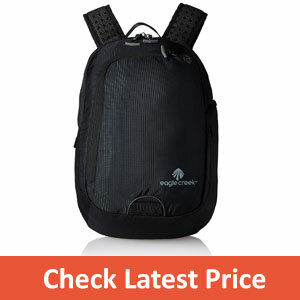 Then, you must look at this eagle creek travel mini backpack. Its design suits the requirements of a day-long or weekend trips. It houses a variety of anti-theft features to make your journey safe. Plus, you will fall in love with the designs of this bag. This small and cute backpack comes with a capacity of 10.5 liters. Added with organized features like mesh pocket, pen loop, key fob and slips pockets. It also packs in reflective accents and air cooling 3D mesh back panel perforated with foam shoulder straps. It is a real comfort while carried on the back. zippers with the two-way lockable feature. Reflective accent to make you visible at night and dark times. Multiple color options to select from. Cannot hold a laptop or tablet above 11 inches. Not suitable for longer trips. If you prefer a backpack which comes in handy for your business as well as relaxation trips, then this Kopak Waterproof Anti-theft laptop backpack fulfill your needs. 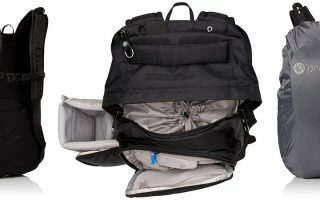 The backpack comes with various features and helps in your corporate as well as relaxation trips. As it keeps your belongings safe and organized. The water-resistant backpack has a built-in rain cover inside the bottom pocket to keep your belongings dry. Also, it contains many compartments which store your clothes, digital accessories, office files as well as the laptop. It is a slim backpack with a shockproof inner container which provides extra safety to your gadgets. Hidden main zippers along with hidden accessories pockets. Well, padded straps with weight balance mechanism. Presence of shockproof cushion with an anti-slip bottom. USB charging port to charge your electronic devices. Hidden pockets sometimes are inconvenient to get things out. Need to use rain cover to completely save from rains. 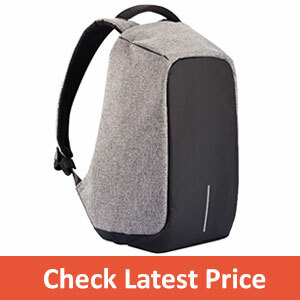 If you are looking for a backpack which is much secure, Sosoon laptop backpack can be the best option for you. The backpack has all the anti-theft security features. In case if you lose your bag or it gets stolen, the high-quality alarm Bluetooth locator inside the bag helps you track your backpack. The well-designed backpack fits in your back comfortably while carrying it. The straps evenly padded gives comfort to your shoulder. Along with that, the waterproof material saves your belongings from the rain. Multilayer material in the back for better ventilation. Has alarm with Bluetooth tracker. Luggage strap to attach it to the trolley. Are looking for a backpack which has lots of compartments with promising security? The Kopack lightweight backpack can be your ultimate choice. The backpack has 10+ slots to pack in your things in an organized way. Plus, the laptop slot of this backpack holds the laptop of the screen up to size 15.6 inch. This backpack gives you the feeling of a package deal in a single bag. The backpack made of the best quality material is water and scratch resistant in nature. The soft bubble foam padded layer makes it shockproof and absorbs the bump. The back padding gives an extra support to the back and padded shoulder gives more comfort to the shoulder. Ergonomic design to distribute evenly on back and shoulder. Extra spacious with 10+ compartments. No good spot for water bottles. Hidden zipper makes some uncomfortable to get things out. Oscaurt business backpack comes with anti-theft technology with a hidden zipper that makes it more secure. The backpack contains 30 to 90-degree adjustable main compartment for easy packing of your belongings. The velcro design inside the backpack keeps the belongings stable inside while moving. The backpack is made of EVA which is a high-quality material. It has a unique design where the shape doesn’t change even after heavy packing. It is ultra-comfortable to carry and is well ventilated which prevents sweat during the trip. Anti-theft design technology with hidden zipper. Built-in charging cable with external USB. Multiple compartments to keep your stuff organized. Well, padded and wide shoulder straps. Small compartments inside the main compartment. Unable to hold laptop bigger than 15 inches. Inner fabric weaker compared to outer one. 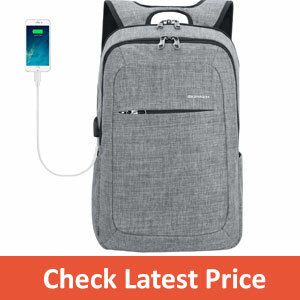 If you are looking for a slim laptop backpack with anti-theft technology then kopack slim business laptop backpack surely brings a smile to your face as your search ends with this backpack. This backpack comes with all the anti-theft technology with a slim design. 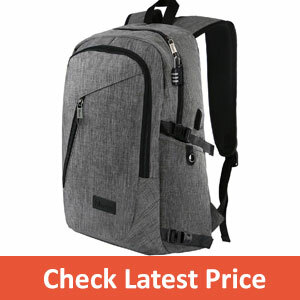 It is a lightweight and slim backpack having a dual-layered enhanced zipper. It is smooth, safe and durable for daily usage. The backpack houses 12 compartments which allow you to organize your belongings according to the category. It offers comfortable back support while on the journey or daily usage. The separate laptop sleeve ensures the safety of your laptop. The presence of bottom private pocket provides protection to your waist. You can lock the zippers of the backpack for enhanced security of your belongings. Presence of adjustable side pockets. Not good for carrying heavy stuff. If you are looking for a backpack which comes handy for business, traveling, and casual daily usage. You can have a look at this MR. YLLS business laptop backpack which may fulfill all your requirements. 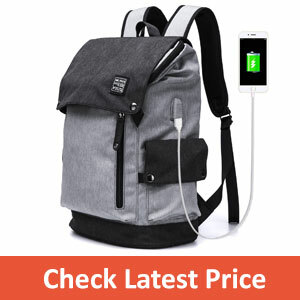 This is a useful backpack with various anti-theft features and a nice design. The backpack designed with feedback from customer experience uses the high-quality material. The main compartment of the backpack is extra spacious to adjust all your daily needs. There are pockets for books and pens which makes it perfect for students. The interior surface is friction resistant and waterproof. The backpack made of high quality durable reinforced material makes it water and scratch proof. The quality zippers of the backpack hold your belongings. And the anti-theft flip-top design secures your belongings inside the main compartment. Made of the durable reinforced material. Can fit in up to 15.6-inch laptop easily. The upper flip top can easily come off. 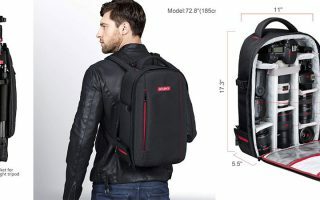 If you are looking for an anti-theft backpack to fit your budget, then Uoobag KT-01 slim business backpack can be one shot solution. Made of 210D Nylon fabric, the backpack is water-repellent and durable in nature. The backpack has many compartments to keep your belongings organized. It comprises of an anti-theft laptop sleeve, the main compartment, an iPad pocket and 2 side zippered bottle pockets. Also, different smaller pockets to store smaller accessories. The presence ofa separate laptop compartment on the back will make your laptop safer. The high-quality lockable zippers keep your belongings safe inside. The high-quality nylon material guards your backpack against theft and water spilling. Presence of Dual Zippers makes your stuff safer. Sunglasses buckle to hold your sunglass. Different size option to choose from. An absence of water bottle pouch. Uoobag KT-01 slim business backpack is a high quality and cost-effective backpack. It is perfect for business traveling, weekend getaways or any other outdoor activities. If you are looking for a budget-friendly anti-theft back then you should go for it. The backpack constructed of durable nylon fabric features a reinforced bottom. 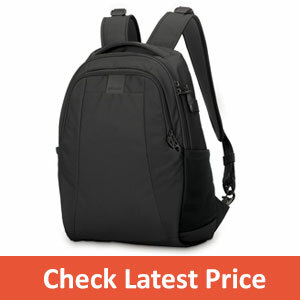 It is a light-weight backpack with curved padded shoulder straps. And gives extra comfort to your shoulder. The backpack contains two sealed pockets which are quite secure. The soft and lined laptop sleeve can hold laptop size up to 17 inches. It comes with metal zippers and a combination lock making it theft proof and reliable during the journey. Can fit in laptop up to 17 inches. Curved shoulder straps for extra comfort. Small zipper size can break easily. If you are looking for an extra spacious anti-theft backpack in a reasonable budget, then Uoobag KT-01 slim business backpack can be your choice. Made of imported nylon fabric, it has a capacity of 35 liters and is water-repellent in nature. Built with high-quality polyester materials having more than 10 functional compartments to pack everything you need. It adds a headphone hole to let you enjoy music with your phone inside. The padded shoulder straps and back padding gives extra support and comfort. Multiple compartments to organize your belongings. Headphone hole to let you enjoy music. Slim design with anti-theft technology. The first thing you should look for is capacity of the backpack. Select a backpack that is big in size with extra space inside. It will help you fit all your requirements for the trip. The ideal size you should consider is above 25 Litres. In newer places, you never know when the sky turns cloudy with heavy rain. So, better carry a water-resistant backpack. It keeps your belongings dry in a wet environment. If you are carrying electronics such as camera equipment in the backpack, then the water-resistant material will keep them safe. As you are looking out for an anti-theft backpack, make sure that it comes with lockable zippers. Some of the latest anti-theft backpacks come with hidden zippers instead of a lockable one. Option to lock the zipper will help keep money safe and will give you peaceful sleep on your journey. A good anti-theft backpack must have many compartments so you can keep your belongings organized. Presence of multiple compartments eases access to the things packed in. Whether you know or not but the majority of the weight of the backpack comes on a hip. Hence, the presence of a well-padded hip belt will make the backpack more comfortable on your back. Always look out for a backpack which is well-ventilated. A well-ventilated backpack keeps your back dry thus, reducing chances of sweat infection. If you are going to buy an anti-theft back, make sure they are scratch proof & cut proof. Most of the anti-theft backpack comes with a hidden zipper and pockets. But still, thieves can get things out by cutting it with the blade from your back. So always get a cut & scratch proof anti-theft backpack to avoid such risks. If you are looking for an anti-theft backpack, make sure it has RFID safe compartment. Hackers these days try to steal credit cards and passport details using RFID reader. Hence, an extra compartment with RFID blocking feature will be a sigh of relief at the unknown place. You should take different security measures to prevent theft and one of them is carrying an anti-theft backpack. 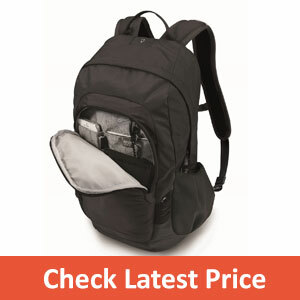 An anti-theft backpack will help prevent theft and ensure the safety of your belongings. So I highly recommend you to carry one. You can read more about why anti-theft-backpacks are necessary here. If you plan to buy a comfortable and reliable backpack for your usage, be careful before choosing one. If you ask me, I personally prefer Pacsafe Metrosafe LS450 Backpack. I trust its embedded features: waterproof, USB charging port, large capacity with shockproof design. I can get this feature-rich backpack with many compartments with the hidden zipper, so it’s among my favorite. 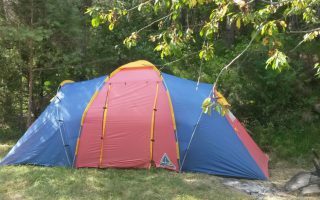 How to Choose a Backpacking Tent?